Gave a talk at WordCamp Salt Lake a few months ago, and thought I would link to the slides. I created them using the slide framework that was developed for Google I/O. My talk was titled Bootstrap, Responsive Theme Development. I talked a lot about generic HTML/CSS things, with a few WordPress specific tricks. Turned out pretty well, I hope to do it again someday. So, in the last few weeks, I have been doing a lot of WordPress theme development. When I see something cool on the web, I want to implement it a new a cool way. 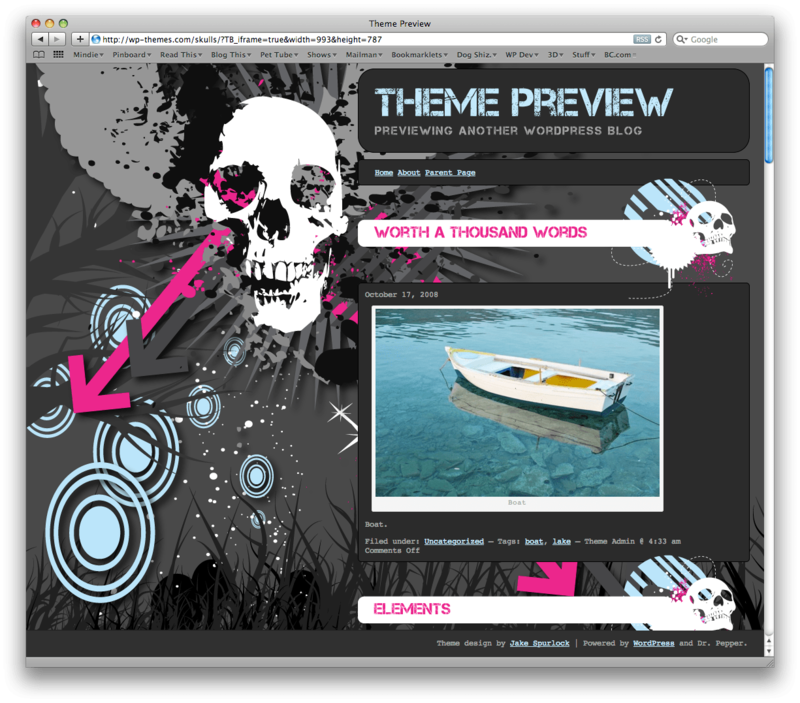 Skulls is basically the end result of some tinkering on the web. Here are some of the methods that I used in this theme. Nothing terribly revolutionary, but after staring at Facebook everyday, I wanted to put a persistent footer, that would have a couple of quick links in it. To create a fixed footer, simple add the following code to your div. Make sure to add some bottom-margin to whatever div is going to be above it. You want to make sure you do that, so when you scroll to the bottom, you can see all of your content. I mentioned already the font replacement. I found some cool vector packs that had some skull designs in them. The post headers have a banner that overlays the other divs due to some negative margins. One thing to be aware of, if you follow a similar design, is to make sure that links have the coverage that they might need. I had them squeezed a lot tighter, but it was hard to click on the post links. So, all in all, I think that it turned out to be a pretty cool theme. Not for everyone, but I think that someone will get a kick out of it. 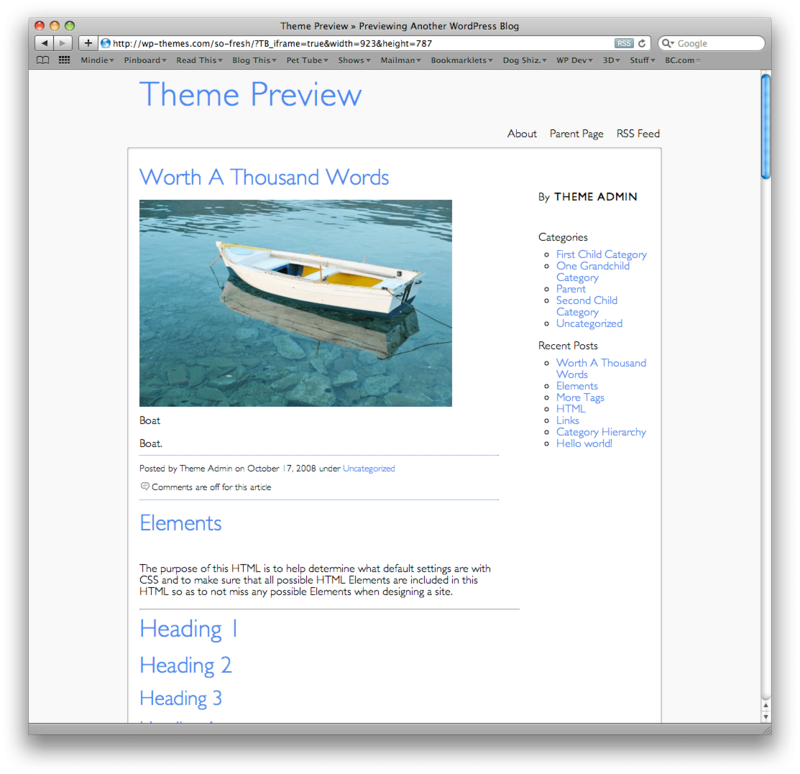 Well, another day, another WordPress theme. In my head, I wanted to design a super clean and simple WordPress theme. I am excited today, to FINALLY release a WordPress theme that I have been working on. In all of it’s glory, A Daring Inspiration. 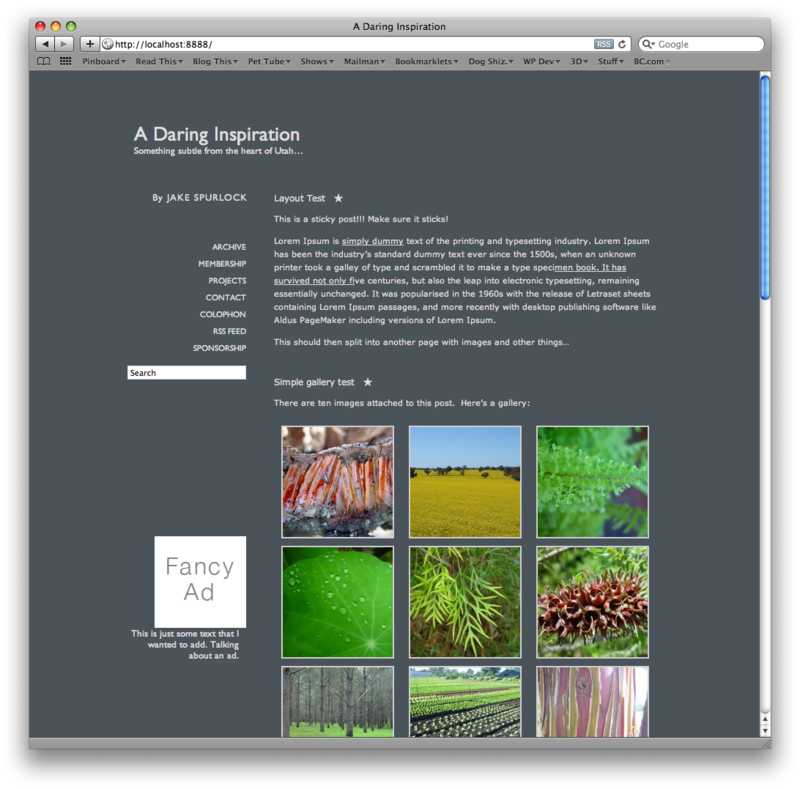 Daring Inspiration is a theme that I have had kicking around in my head for a long time. For those unfamiliar, there is a great site on the internet run by mac pundit, John Gruber called Daring Fireball. John write simple text posts, and shares them in a link style that lends itself to being more of a link style blog then a traditional one. With that being said, this theme is GPL licensed, XHTML valid, and rocking in its simplicity.